"Plan Your Parties The Easy Way With This Quick And Easy Planner System"
... plus full Master Resale Rights so you can sell all this yourself and keep all the money! Parties can be great fun, but a good party can take a lot of planning. It's Party Time is a quick and easy software tool which will generate a whole set of specially designed party planning forms to help you plan your parties with ease. It also includes a special party budget calculator which will keep track of all you party expenses, automatically calculating totals and budget under/overuns for you. It's Party Time can be used again and again to plan every party you hold in the future. Since each party is recorded separately, you can keep records of every party you hold, ready to refer back to at any time in the future. 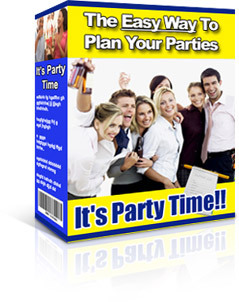 Start planning your parties the easy way now with your copy of It's Party Time. Your copy of It's Party Time comes with our special collection of three valuable cookery ebooks, packed with a total of over 800 delicious desert recipes. With a total of over 800 recipes, you're sure to find something really special and unusual to impress and delight your party guests. Your copy of It's Party Time comes complete with Master Resale Rights. You can also add it as a bonus to other items you sell if you wish, give it away as an incentive to subscribe to a newsletter or include it in packages and membership sites. This special software allows you to easily plan all your parties. Consider how much you will spend on parties in the future and I'm sure you'll agree that this software is a real bargain at just $9.97! And of course, don't forget the great collection of desert cookery ebooks on top. Despite the amazingly low price of this package, I know you may still have a few lingering doubts as to whether It's Party Time is right for you. That's why I'm offering my 30-day, no risk, 100% money back guarantee. If at any time within the next 30 days, you decide that It's Party Time isn't right for you, just send me a quick email and I guarantee to refund your money in full, no questions asked. I cannot promise how long I will continue offering this at such a stupidly low price. The price could go up at any time without notice, so please order now to avoid disappointment. 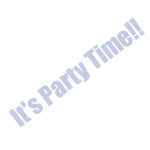 Requirements It's Party Time is for use on PCs running Microsoft Windows. It also requires a spreadsheet program to be installed on your PC. Suitable software is included with the package. Alternatively if you already have Microsoft Office or another office package installed on your PC, you can use the office package spreadsheet program instead.